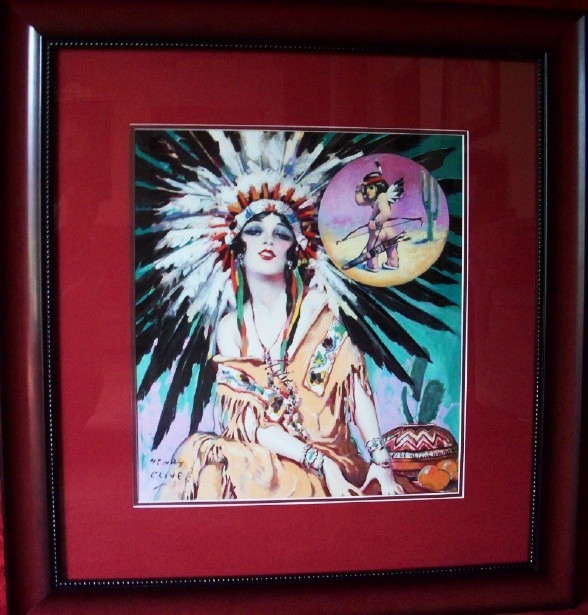 This is a gouache on board painting of an Indian maiden, created by Henry Clive for for the June 18, 1933 edition of William Randolph Hearst's The American Weekly Magazine. The publisher often asked Clive to create images of enchantresses that shared a common theme. This painting is one such image from a series of Cupid inspired young women, each about to be struck by Cupid's arrow. Clive's use of bold, brilliant color makes this painting stunning. Henry Clive was born Henry O'Hara in Australia in 1882. During his early career, he supported himself as a magician. He settled in Los Angeles in the 1920's and starred in a few early silent films. He got his start as an illustrator around 1920, while working for Paramount Films. His artwork appeared on many silent movie posters during the early 1920's. He became recognized for his paintings of Ziegfeld Girls, as well as some popular Hollywood starlets. Clive later became an art director for Paramount Pictures. His artwork can also be found on various tins bearing the images of the beautiful Hollywood movie stars of the time. Henry Clive did magazine cover work for True Confessions, Screen Play, Theatre Magazine, Smart Set, and The American Weekly Magazine (a relationship that lasted for 3 decades). He created several murals that graced the walls of popular Hollywood restaurants in the 1930's and '40's. He did quite a bit of ad work for Vivaudou, and created a few calendar illustrations for the Louis F. Dow Calendar Company, as well. Clive created many of his works in pastels, as well as oils, and quickly took a place alongside Rolf Armstrong and other top illustrators of the time. He was married a total of six times during his lifetime. Henry Clive passed away in 1960.